“At the end of the day you will not remember the person with the most beautiful face but you will remember the person with the most beautiful heart and soul.” Keeping this in mind, the staff and management of the HCG Apex Cancer Centre, Borivali (West) invited the children of Bosco Boys Home, Borivali to their hospital on 15th September, 2018 for celebrating the auspicious Ganpati festival from 3 pm to 5pm. The 35 children of the orphanage were accompanied by 4 staff members and Cl. Jittin Mathew. This was the first year ‘HCG Apex Cancer Centre’ was celebrating the festival in their organization and to make it special this indoor activity was arranged for the boys on this auspicious festival. The trip consisted of Ganpati Darshan in the hospital, session on Health and Hygiene, Drawing competition, Tattoo making and return gifts and snacks for the children. Even the travelling was taken care by the hospital. 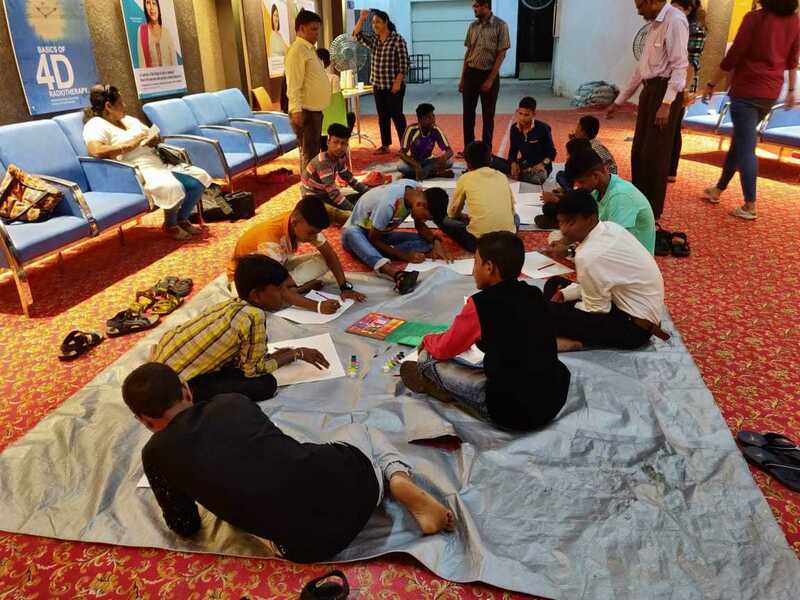 After the sessions, a creative artwork of Drawing Competition and Tattoos making was organized for the kids which they enjoyed wholeheartedly. As a part over delicious snacks along with gifts were given to the children. The event was well organized by Soniya Masurekar, Assistant Manager of HCG Apex Cancer Centre and her team. All the children were glad to be part of this enthusiastic and informative event. Master Pratik Gade on the behalf of Bosco Boys Home, thanked all the staff of HCG Apex Cancer Hospital for spending their precious time and conducting various activities as well as showering them with all the lovely gifts. He concluded by saying that this programme taught him various points on how to remain healthy and how to eat healthy food. In the end, all boys showed their gratefulness by singing a ‘Thank You’ song to all the team of Apex Cancer Hospital.